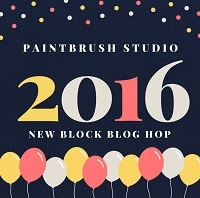 Welcome to the New Block Blog Hop, sponsored by Paintbrush Studio! 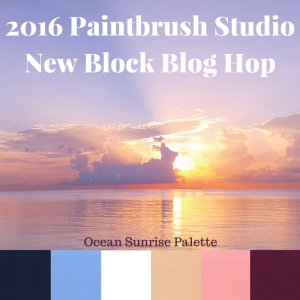 This is the second annual event, and all the bloggers involved are using Painter's Palette Solids. 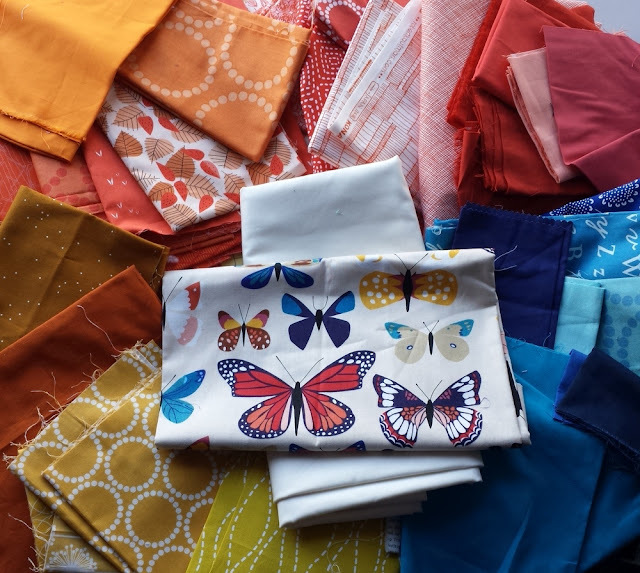 The chosen palette, Ocean Sunrise, is stunning, and I can say from experience that these fabrics have a beautiful, smooth hand! Thank you to Paintbrush Studio and our hosts Yvonne @Quilting Jetgirl, Cheryl @Meadow Mist Designs, and Stephanie @Late Night Quilter for their hard work in making this blog hop run smoothly! I'm Jess, and I typically make quilts using improvisational techniques. Whenever I create a block tutorial, I err on the simple side because I prefer modern design and minimalism. When you put minimalistic blocks together, you can create an overall design that is visually pleasing (with little effort)! 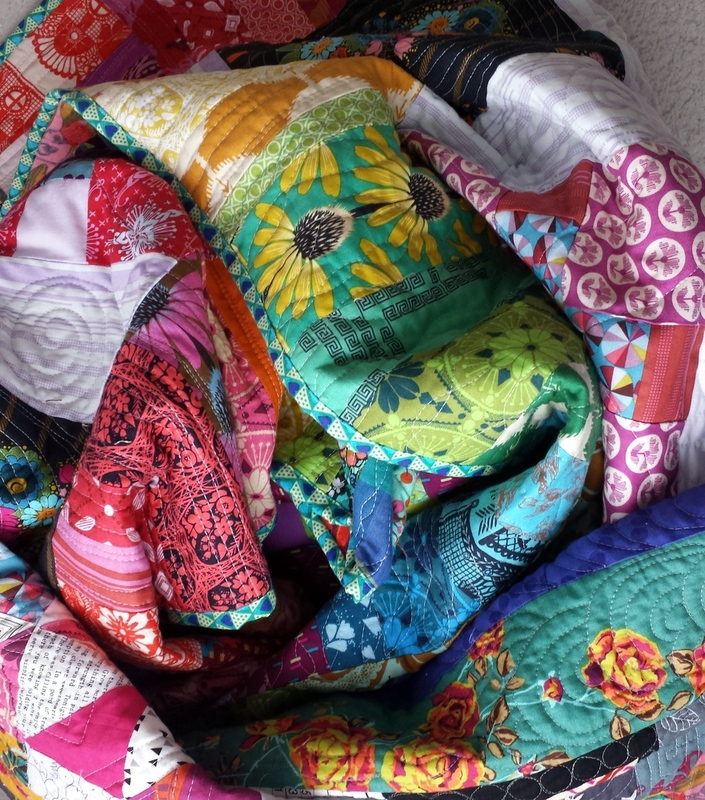 It's freeing and exciting to let a simple block take over. Just like my block from last year (the wonky diamond/thread block), this quilt block can be altered in a thousand ways, which I'll share some of below! 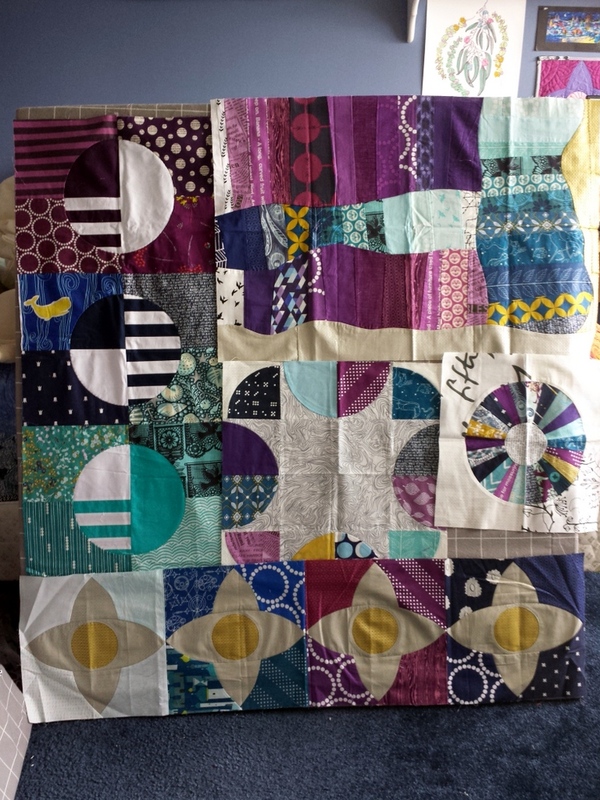 For this block, I used 5 of the 6 fabrics in the palette (no white). You'll use the most of your chosen background color, so choose wisely! 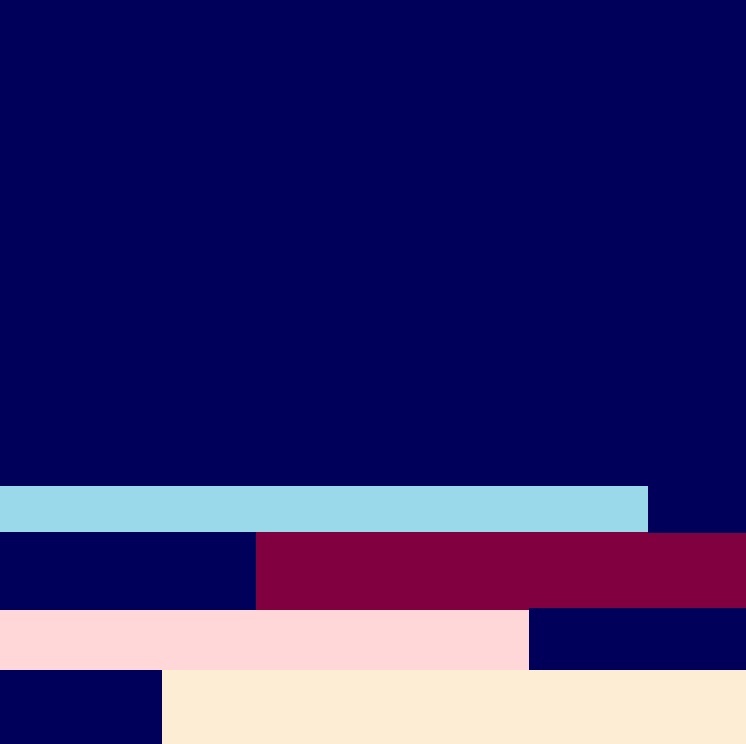 Here, I wanted the block to look like an abstract version of the sun rising (the tan is the sun, and it gets lighter as it rises into the night - almost day - sky). Note: All seams are a scant 1/4 inch. 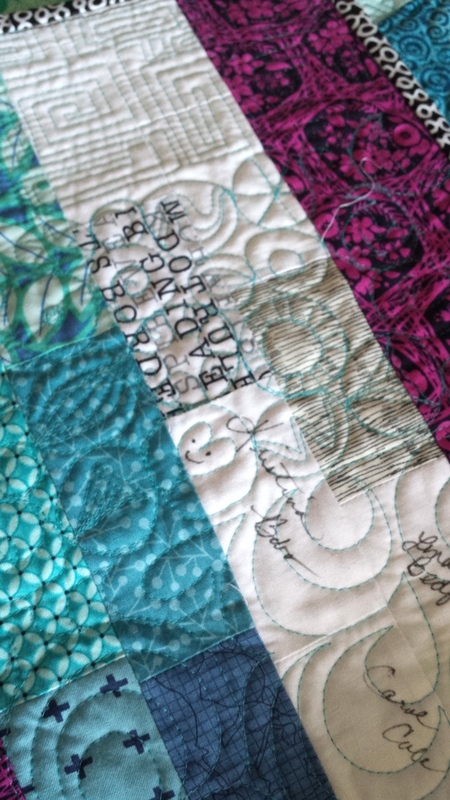 See here to read more about scant quarter inches. Block will be 12.5" square unfinished. (1) - Peach - 1.75" by 18"
(1) - Pink ("Coral") - 1.25" x 18"
(1) - Burgundy ("Bordeaux")- 1.75" x 18"
(1) - Light blue ("Daydream") - 1.25" x 18"
(1) - Peach - 1.75" x 9.75"
*(1) - Burgundy - 1.75" x 8.25"
(1) - Light Blue - 1.25" x 10.75"
*The leftovers for Pink and Burgundy can be used to make another block! 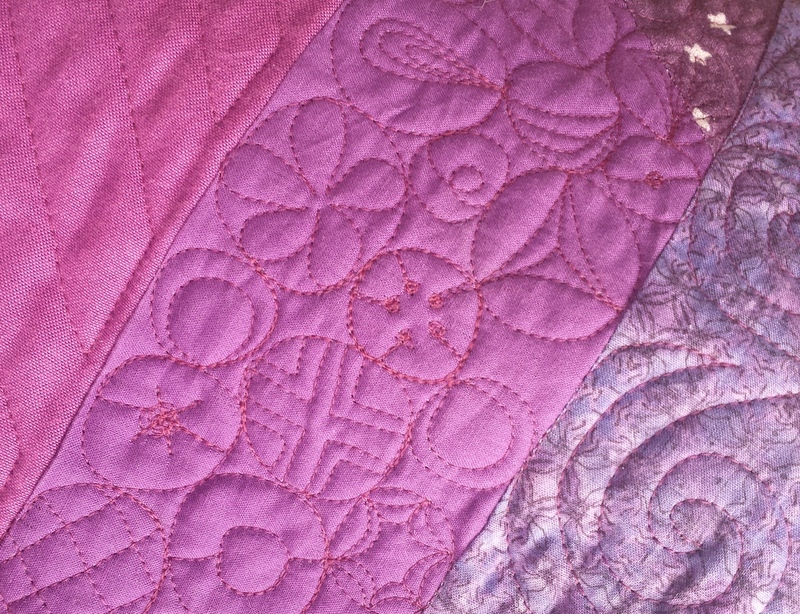 You could also sew strips of Peach and Light Blue together for subsequent blocks. No one will notice the seams. Use your fabric up! 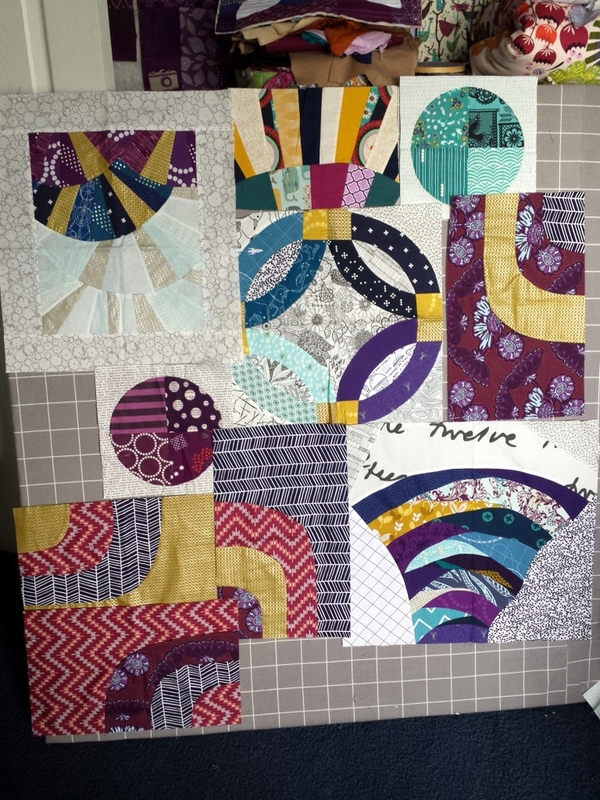 Be aware that you will need more fabric to make a whole quilt of these blocks, especially of the background color. (1) - 1.75" x 18"
(1) - 1.25" x 18"
(1) - 8.5" x 12.5"
1. Lay our your strips to determine your color order, and alternate the side Dark Blue sits on. 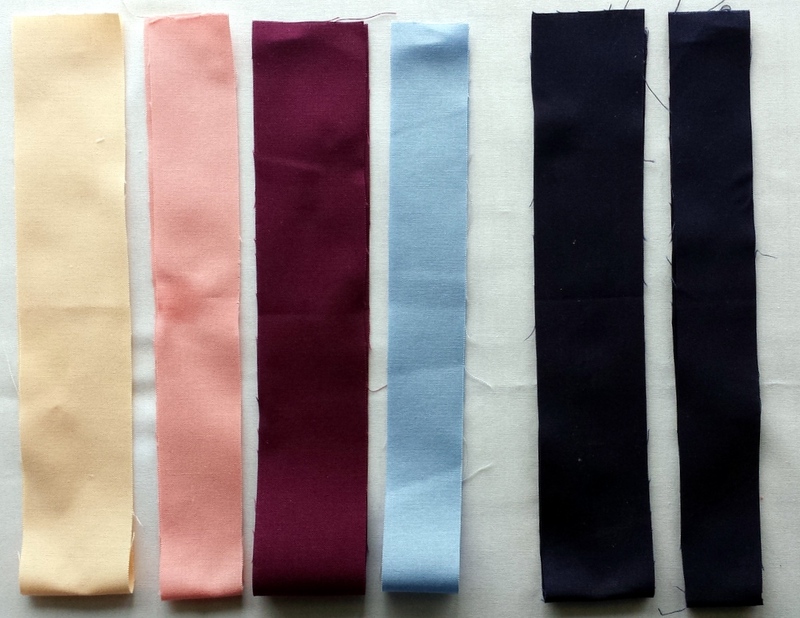 From top: Light Blue, Burgundy, Pink, and Peach. 2. 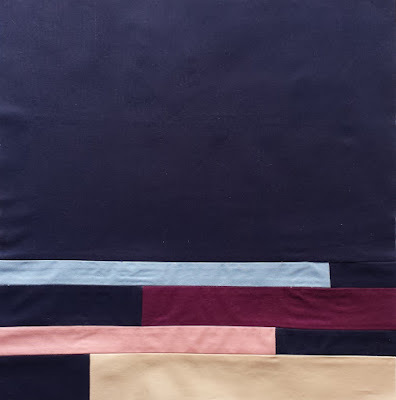 Sew your small dark blue pieces to your colored strips. 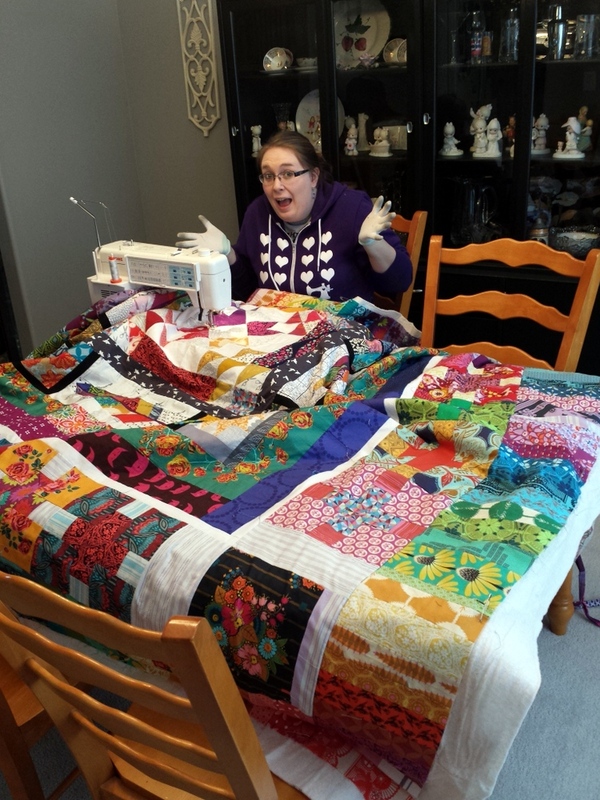 It doesn't matter what side you sew the strips to because you can just flip them around. See second subcut chart above for which dark blue pieces go with which color. 4. Sew all rows together. Your finished sunrise piece should come out to 4.5" x 12.5". 5. 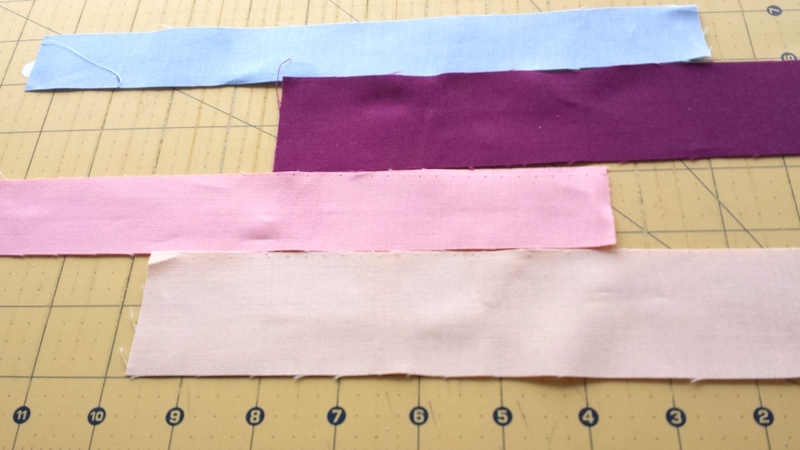 Sew a large background strip 8.5" x 12.5" to the top of the light blue piece. 6. Press all seams open. Your block is complete! There are tons of options for this block. 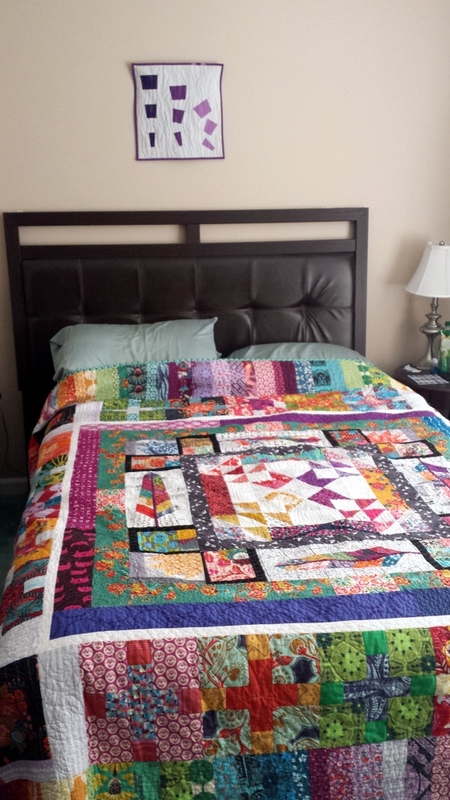 You can simply alter the order in which the strips are pieced together to create a different look. 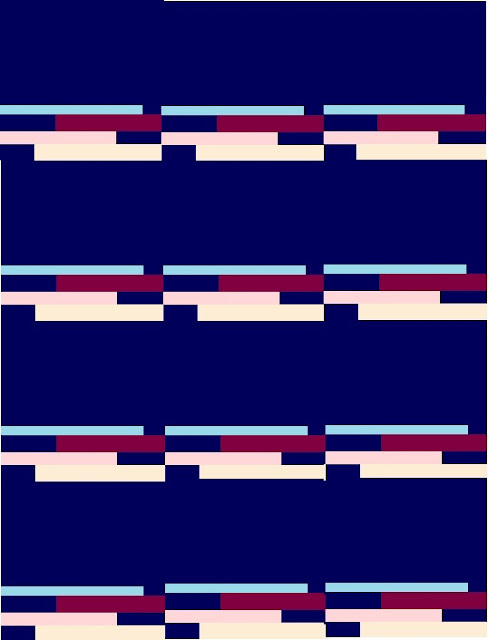 You could create less negative space in the background and instead piece together two strippy parts (one on top, one on the bottom). You could also change the strip sizes (go even smaller or larger), or alter how far horizontally the sunset strips reach. You could even go wonky. 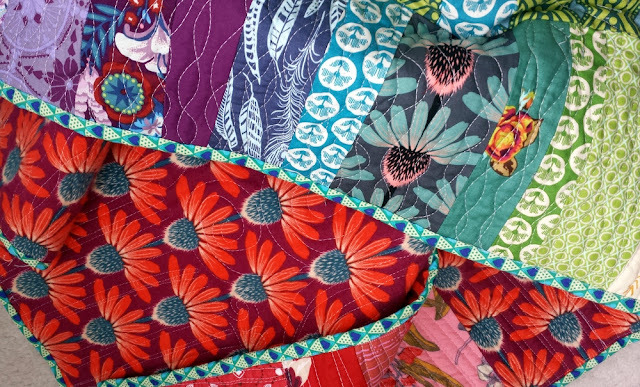 This block takes very little fabric to make, so go wild with it! 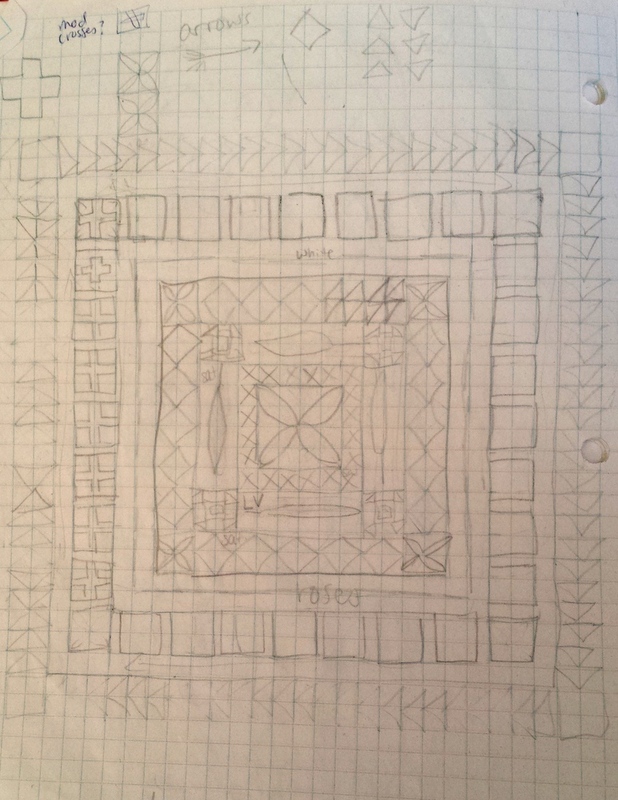 Here's a traditional layout of the quilt block - look at all that fun negative space for quilting! 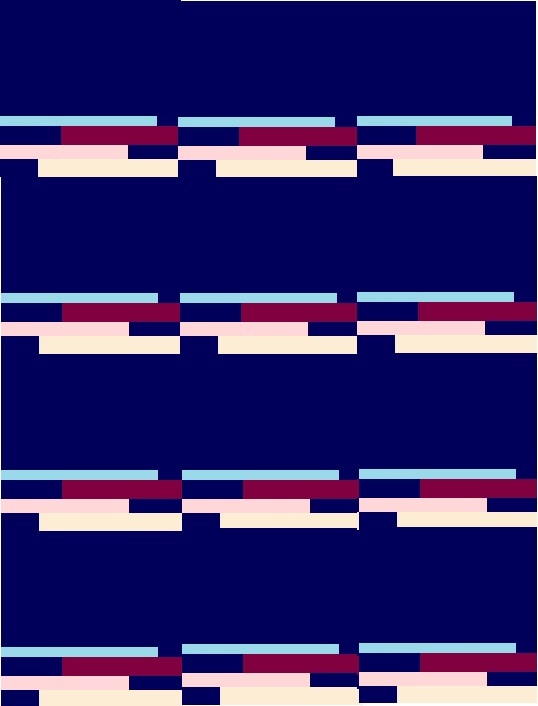 This would measure 36.5 x 48.5 - perfect for a graphic, modern baby quilt. Here's a unique one - turn the block at random! You could make 12 blocks just like above and have fun making combinations. 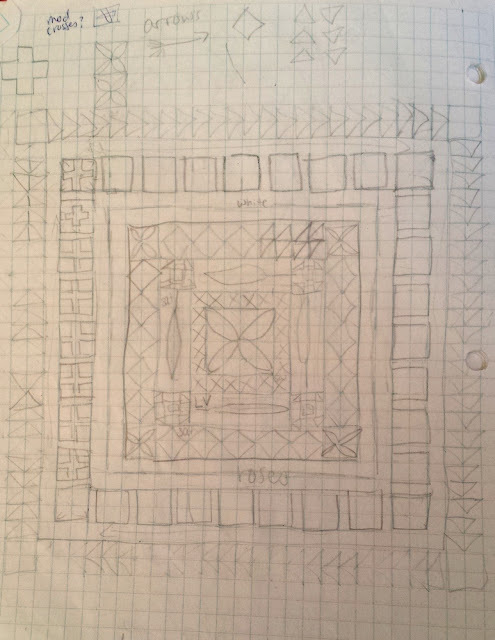 This one has a distinct improvisational log cabin feel to me. 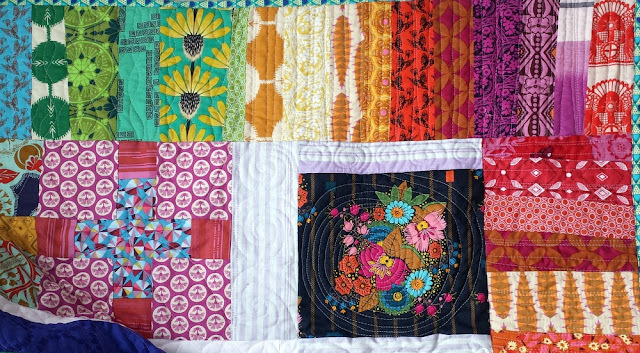 If I was to make this block into a quilt, I think I'd make it like this! Don't forget to pop around and check out all of the other FREE tutorials for today! There will be many more on Tuesday and Wednesday - 40 overall! - check the main blog hop post here for more info. Enjoy and thanks for reading! This post features a quilt that was made FOR ME (I still can't believe it) by my guild, using scrappy improv and my favorite colors. 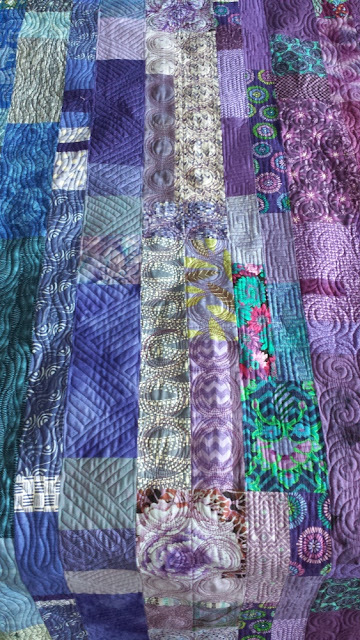 Rows were made by guild members and the whole thing was sewn together and quilted beautifully by my partner-in-crime, Jessica Levitt (@jtlevitt). 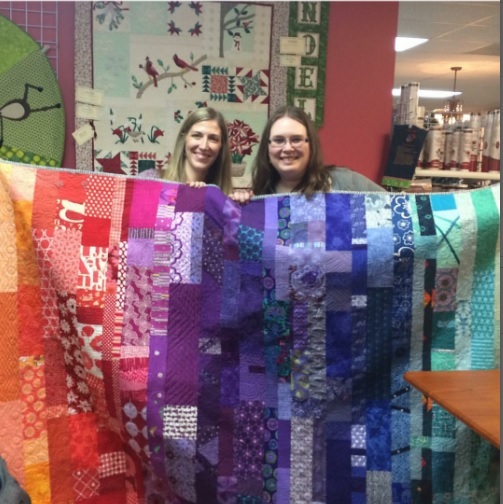 It was a surprise for me at our March meeting. Thank you, friends, for a gift I will treasure forever. It is absolutely stunning and I use it every day!! Many of you may know that I recently stepped down from leading my local Modern Quilt Guild, the Central Jersey MQG. Our founder, Jessica Levitt, handed the presidential reins over to me after two years, so it only made sense for me to do the same after 2 years. A bit like good old George Washington, if you will. New blood is good, and quite frankly, I need a break. Why/how did I become involved in guild leadership? Well, I love and live to lead, teach, and volunteer. There was an opening and I went for it. I became the Webmaster, which is a President-appointed position, after 1 year of joining the guild. I was/am skilled with Blogger and social media, and no one else had volunteered. I ended up keeping the Webmaster position for three years - throughout my year as Vice President and 2 years as President. Being the Webmaster and President at the same time was its own unique workload, but it made sense to me often times. This year, our new President and Webmaster are separate positions again, and I think it's for the best. Plus, the two people who now inhabit those positions, Neva and Maggie, are rock stars! What are the perks of volunteering to lead within a quilt guild? There are many. Getting to know nearly everyone in our 60-member guild by name. Leading meetings and crafting a year (or two) of monthly programming. Scheduling speakers and workshop teachers, sharing meals with them, and driving them around. Developing people and online management skills further. Making executive decisions for the good of the guild. Being the spokesperson for the guild within our state and the international MQG. Speaking with guests and meeting visitors who are thrilled to be there. 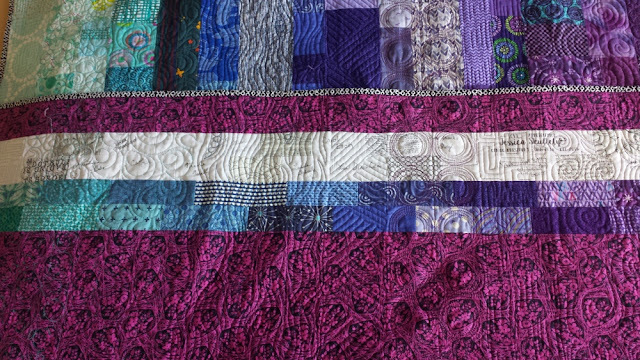 Working with an executive board of passionate, hard-working, quilt-loving friends. 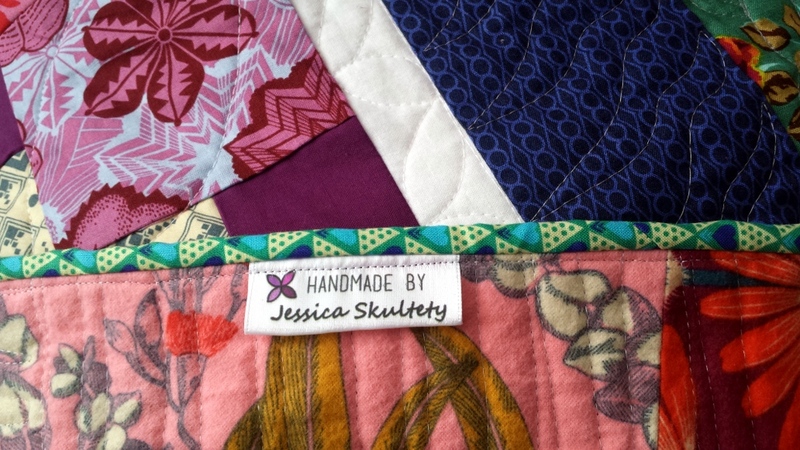 Spreading a love for modern quilting. Label on the back + signatures. The rainbow coincides with the front!! Kristina, that little heart face gets me every time! It's also difficult at times. Keeping up with emails from members and guests weekly was a lot of work on top of my personal blog emails and general social media presence. 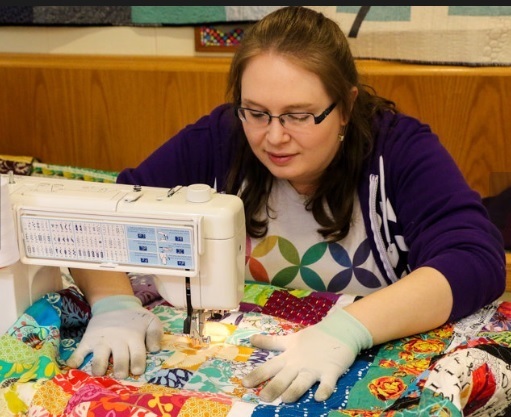 I oversaw and led retreat and workshop planning, inter-guild gifts, QuiltCon charity quilt making, guild banner making, 2 quilt show preparations, and more. 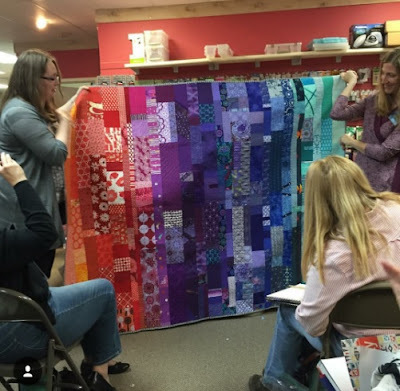 Additionally, our guild meetings are VERY involved (but of course, a blast); guests often told me they couldn't believe how much we had going on. 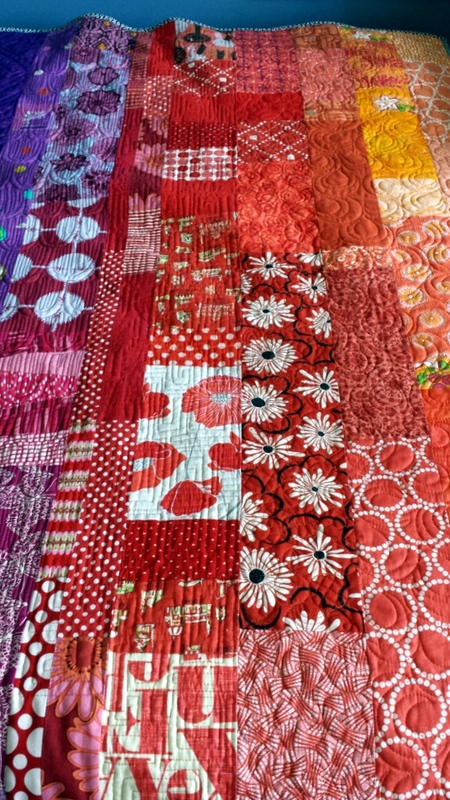 For example, you could expect to hear about business, member announcements, recaps and comments about recently attended quilting events, our guild bee (now three years running), the annual guild quilt-a-long, a challenge at every meeting (including the international MQG challenges), a swap at most, a 10-15 minute demo, and show and tell. Phew! When you only meet once a month, there's a lot to do! After my first year as President, I realized that we needed a better way to communicate business, so I developed the guild newsletter. Anyone can sign up to receive it on the top left sidebar of our guild site. I always sent it out the first week of the month, so that members had time to read it before our meeting on the second Tuesday. 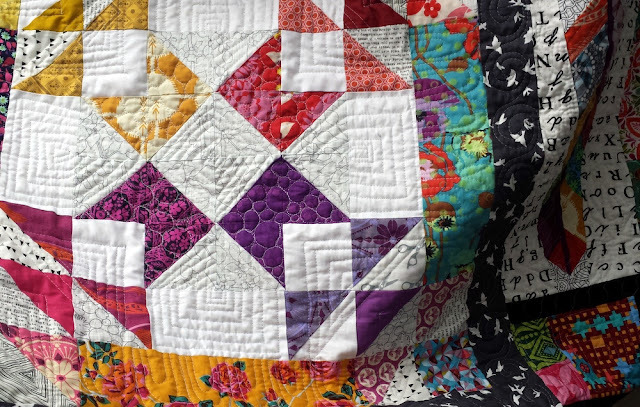 Working with MailChimp for the first time was a huge learning curve, but I learned to love it, which is one reason why I developed my own bi-monthly modern quilting newsletter, The Wonky Press, last October. I'd personally like to thank all of you for your continued support of the guild and my own quilting. I never thought that I would be in the position of guild president when I joined four years ago as a very intimidated college student (you are all STUNNINGLY talented!). You have become friends and loyal comrades, and it feels like coming home whenever we have a guild meeting or event! Thank you for making all of it worthwhile. I'll still be around, but you can look towards the back of the room instead, where the old board will surely be cackling like Statler and Waldorf. Apparently, ending a huge project inspired me work on/start a bunch of little ones. I shared the start of my rainbow mini quilt for Mid-Atlantic Mod last week. I'm so excited to bind this baby and give it away! 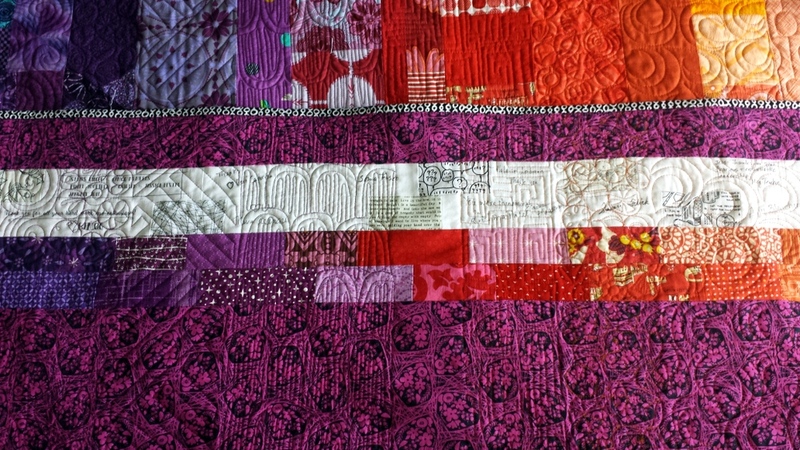 I don't do a lot of straight matchstick quilting (very close lines) but the design called for it. 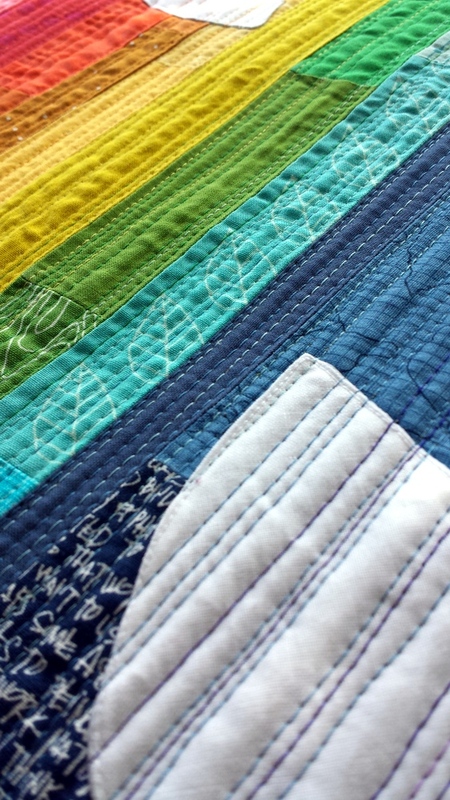 Plus, I had visions of rainbows of Aurifil thread shining on the white fabric. I have some cool in process pictures that I'll share when it's done (they show too much of the design). By the way... if you guessed that I'm using orange peels, you're right! 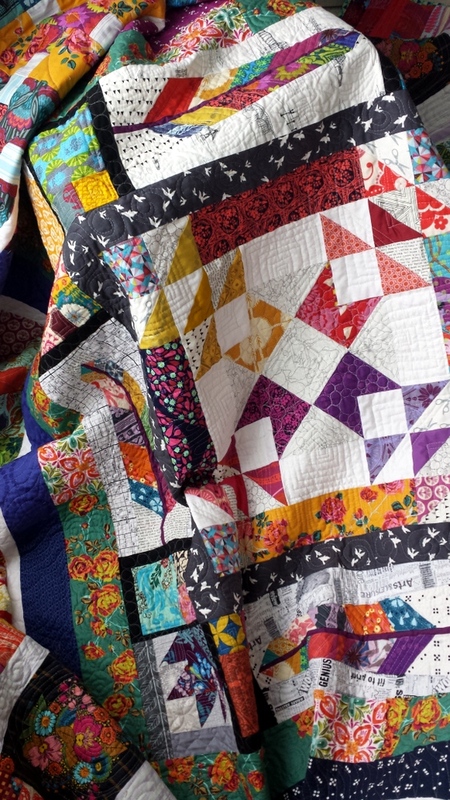 In other news, I've started ANOTHER orange peel quilt. Shocking, right? 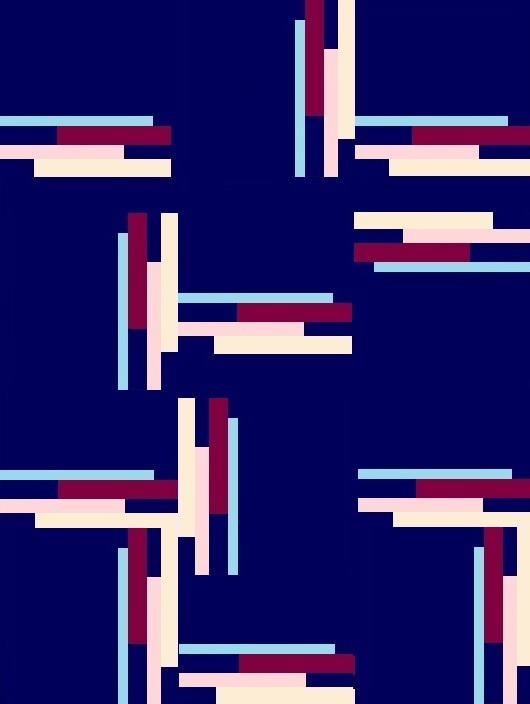 I posted four layouts on Instagram, and almost everyone agreed on this design. 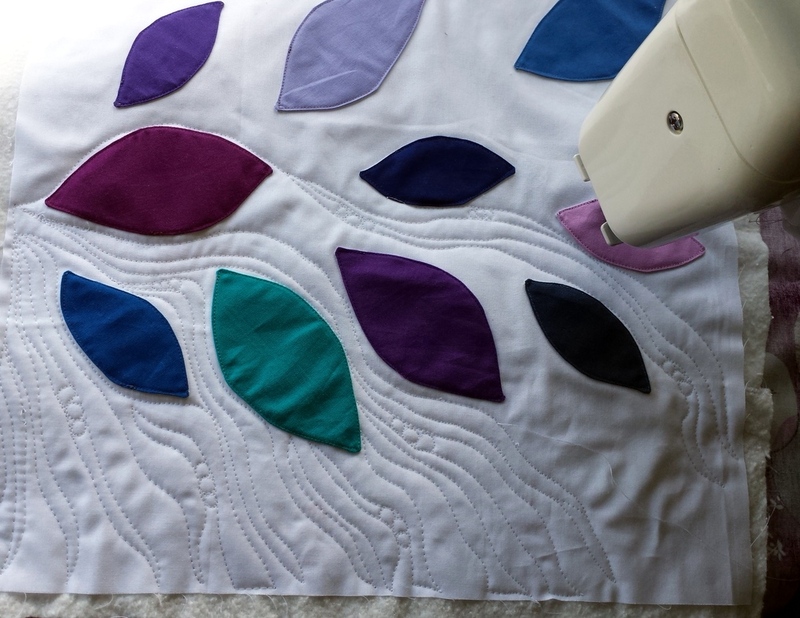 The quilting is so much fun, and I can't wait to share more soon. This is for the Quilt Alliance's annual fundraiser/contest with the theme "Playing Favorites" this year. 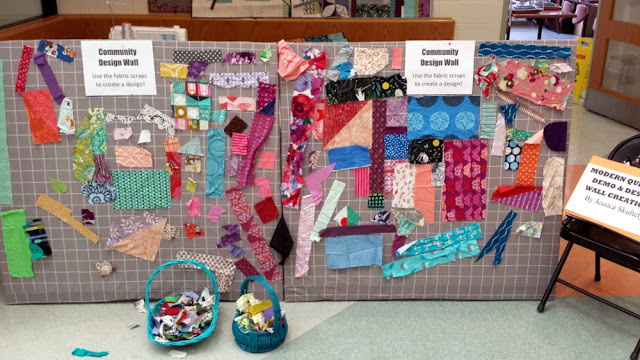 Your 16x16" quilt is donated to the Quilt Alliance, exhibited, raffled off, and documented in the Quilt Index. Click here to read more. 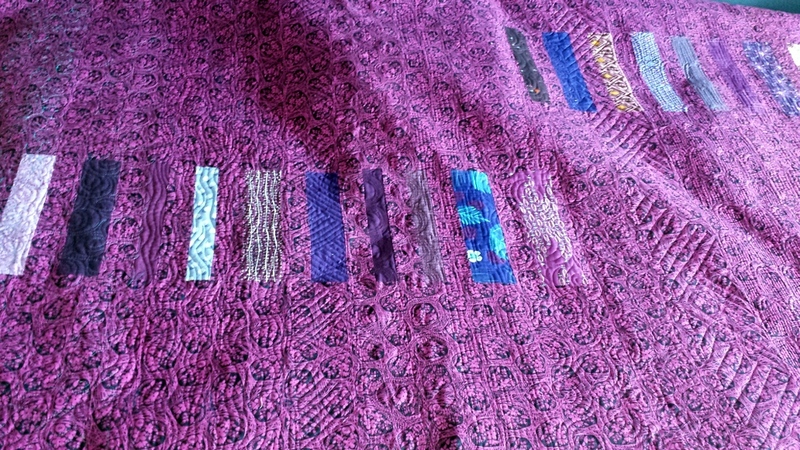 This fabric pull is for a new class sample for one of my next classes in development. The inaugural class is going to be held at a guild this summer (details tentative, but hopefully it will be finalized soon!). Those Lizzy House butterflies have SO many amazing colors! See you on Friday for some thoughts on quilt guild leadership and a special gift I recently received.